The relaxing aromas of eucalyptus or lavender are irresistible. Just a whiff means a steam room, and a moment of pure, uninterrupted bliss is not far away. There's much more to discover inside than a sense of euphoria, however. Steam rooms are all-star stress relievers, yes. But, they are even better at eliminating toxins, rejuvenating the skin, and much more. All you have to do to tap into steam room benefits is sit back and relax. So, what is the optimal steam room frequency? 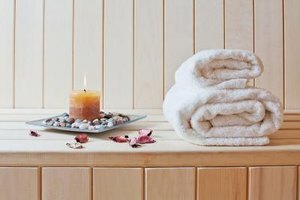 Should you take a steam bath every day? Or, is popping by for a weekly or monthly steam room session best? Taking a look at the history books can help with some answers. Early bathhouse culture, dating back centuries, gives a few clues into the ideal steam room frequency today. In fact, the earliest known public bath dates back to 2500 B.C. Then, the Romans used steam baths as gathering places and visited them often, taking a steam bath every day. That culture persisted long after the Roman empire fell. Turks adopted steam baths and made them their own as hammams around the seventh century. Their guided bathing ritual included a 45-minute steam room, scrub, and massage experience. Today, luxury spas still offer this pampering steam room session. A bit of the European bathing culture also hopped the pond with the colonists, and Benjamin Franklin famously maintained a daily steam bath routine. For him and other spa-oriented cultures, a steam bath every day did the trick. Researchers agree that the more steam the better. Recent studies confirm that upping heat sessions from once weekly to daily is associated with a drastic drop in risk of chronic diseases and cardiac events like strokes. However, visiting a steam room every day for extensive 45-minute sessions might be too much to squeeze into your hectic schedule. Now, visiting a steam room once weekly is still plenty of time to lower stress, help muscles recover, improve circulation, and clear skin. It's not a coincidence that most spa facials include some quality time under the steamer. In less than 10 minutes, the steam opens the pores and helps clear out congestion and eliminates acne-causing bacteria. The same occurs in a steam room, no esthetician required. Even a short steam sesh once a month results in a dewy, plump complexion. All that sweat quickly cleans out pores, and the heated room increases blood flow to produce a post-facial glow, without the dedicated treatment. The whole point of sitting in a steam room is to sweat. And, the longer you sit, the more you sweat. But you have to remember that every bead of sweat rolling down your limbs is water leaving your body. Sit too long, and you'll risk dehydration and overheating. As long as you drink plenty of water before, during, and after any steam room session, you'll stay healthy and hydrated. All that adds up to a steam room sweet spot right around 10 to 15 minutes. The next time the steam room beckons, give in to the enticing aromas and get ready to sweat your toxins and sore muscles away. 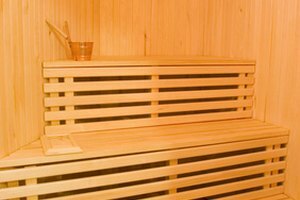 NCBI: Effects of far-infrared sauna bathing on recovery from strength and endurance training sessions in men. Jennifer is a New York City-based contributing writer focusing on wellness, spa, and travel. Her work has appeared in BudgetTravel.com, ApartmentTherapy.com, American Spa, GoodHousekeeping.com, and more. Jennifer previously worked at American Spa, American Salon, and InStyle magazines. She is a graduate of Northwestern University, where she earned a a degree in Journalism and minor in Psychology.